Hmmm, a fresh glass of milk... what a cool treat for a milk lover! It is said that "a glass of milk a day could benefit your brain", so, a delicious glass of fresh milk in the morning may be the best way to give you the drive for the day and keep yourself healthy! I think that, for the majority of us, a glass with cold or warm milk, our best friend, and moreover, a tasty one since first hour in the morning till late in the night! ... Can you imagine that milk, this white and silky drink is our best silent companion? And it knows all our inner thoughts or loud words shared with our family since our childhood!? And if served plain, fresh milk becomes the perfect non-alcoholic beverage; while if you like to enhance its taste you can serve it in cocktails, coffee or tea! Moreover, turns every food into a delicious meal - either as part from a main dish or part from a large variety of deserts and sweets (for example, the delicious pumpkin rice milk pie). 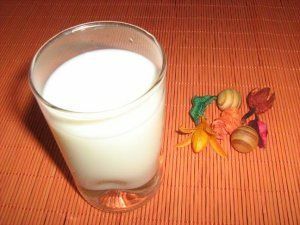 So, let's enjoy some cool recipes with milk and also drink a delicious glass of fresh milk! Milk the perfect drink for everyone in any moment of the day. Easy to make, nutritious and sooo tasty! Topped with chocolate, fruits and/ or whipped cream, they are a big temptation! Milk is a white liquid produced by the mammary glands of mammals. It is the primary source of nutrition for young mammals before they are able to digest other types of food. Early-lactation milk contains colostrum, which carries the mother's antibodies to the baby and can reduce the risk of many diseases in the baby. Milk derived from cattle species is an important food. It has many nutrients. The precise nutrient composition of raw milk vary by species and by a number of other factors, but it contains significant amounts of saturated fat, protein and calcium as well as vitamin C. Cow's milk has a pH ranging from 6.4 to 6.8, making it slightly acidic. There are 2 distinct types of milk consumption: a natural source of nutrition for all infant mammals and a food product for humans of all ages that is derived from other animals. 1. Take frozen fish and leave in a dish of milk to thaw. This improves the flavor and texture so that it tastes just as good as fresh caught fish. 2. A quarter cup of powdered milk added to the water when boiling corn on the cob makes it taste sweeter and gives a sifter texture. 3. Dip half a lemon in a little milk and use to cleanse stained fingers. The lemon lifts the stain and the milk soothes the skin. 4. Use milk to shave with if you have nothing else to use as a barrier. 5. Make your own silver polish with sour milk. You can add a drop of lemon juice, or vinegar to the milk if it isn't already sour and it will immediately curdle. Soak the silverware in the milk for around thirty minutes, then wash in mild soap and rinse well. Your silver will sparkle. 6. Dab milk onto mild sunburn and it will cool the skin and prevent any further damage. 7. Mix a little powdered milk into a paste with water and a small pinch of salt. Use this paste to relief insect bites. The enzymes in the milk neutralize the irritants in the bites. 8. Dry skin can be repaired by rubbing with a little cold milk. Allow the skin to absorb what it needs and wash the rest away. Do this two or three times a day until the problem is solved. 9. Use a thick paste of powdered milk and water to remove make-up. Remember to rinse well after removing the paste. 10. Milk is an excellent facial cleanser - make a very thick, smooth paste of dried milk powder and use as a face mask. Spread the cream on the face and relax for half an hour before washing it off. Your skin will be soft, clean and glowing. 11. Make yourself a Cleopatra foamy bath by adding a cup of powdered milk as the bath is filling. Your skin will feel wonderful. This method of softening and beautifying the body was used by the ancient Greeks and Roman and is used today in Japan. 12. Japanese Milk Bath - A paste of fine oatmeal and milk will remove stains and dirt from hands. This is an excellent way to pamper hands after working in the garden. 13. Liquid milk cleans patent leather shoes to a gleaming shine. Simple rub them with a little milk on a soft cloth. Leave to dry and then buff them up. 14. Ink stains on clothing can be removed by soaking the area in milk. This can take anything from half an hour to overnight to remove the stain completely. It depends very much on the type of ink. 15. Ice cold non fat milk will sooth the discomfort caused by poison ivy. 16. Clean the leaves on plants such as rubber plants and yucca, with skimmed milk and a soft absorbent cloth. Make sue that you wipe away the residue. 17. Make mock cream. Mix together one cup of dried milk powder and one cup of iced water. Whisk until it thickens. 18. If you like to add essential oils to your bath water, mix them with a little milk before adding to the water. The milk helps to disperse the oil and stops the tub getting slippery. 19. 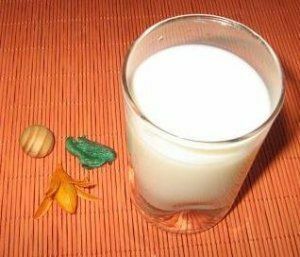 Milk is also good to use as carrier oil for essential oils during massage. 20. Fine cracks in china plates and cups can sometimes be repaired by boiling them in milk. The milk reacts with the kaolin the china and closes the crack. It is said that milk is the single product of animal origin that does not create acidosis - does not make one become old or sick. It is known that vegetable products (vegetables, cereals, fruits) are alkaline, and animal products (meat, eggs, fish) creates an acid medium, while milk is the exception - its presence in our organism is neutral. - Plants - soya and coconut.